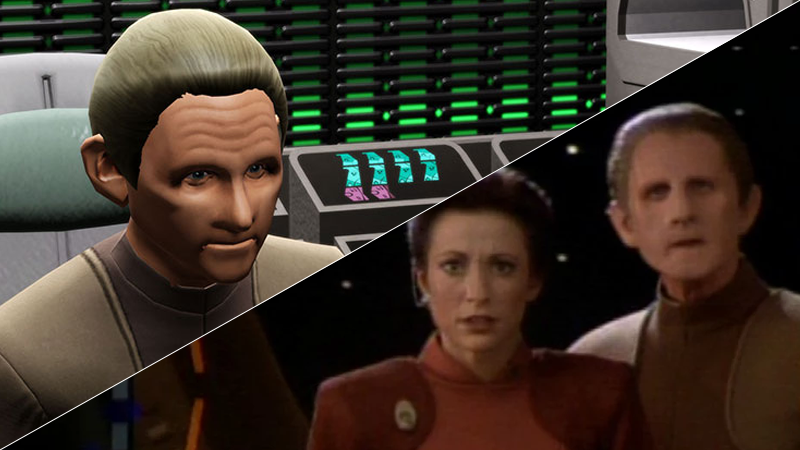 Odo as he appears in Star Trek Online, and alongside Kira in Deep Space Nine. Today marks the launch of Victory is Life, the latest expansion for Cryptic’s free-to-play MMORPG Star Trek Online. Themed around the locales and story of the Deep Space Nine television series, the expansion follows up with familiar faces from the beloved TV in the decades after the end of the Dominion War—and the actors who played them, too. René Auberjonois, who played DS9's chief of security Constable Odo throughout the entirety of Deep Space Nine’s TV run, is one of the latest. Auberjonois is joining 11 other members of the show’s cast to reprise their roles in the new expansion’s storyline, which sees players head through the wormhole to the Gamma Quadrant to investigate a mysterious marauding new species called the Hurq, threatening to bring war to the quadrant once again. To celebrate the launch of Victory is Life, io9 spoke to Auberjonois about getting the chance to play Odo again, as well as the impact Deep Space Nine has had on science fiction for the last two-and-a-half decades. io9: What’s it been like returning to Odo after all these years? What was it that you think made now the right time to step back into this role? Auberjonois: Their willingness to pay me to do it! Auberjonois: That is, in fact, the case. And you know, I have found that once Deep Space Nine was on Netflix, the interest in the show quite clearly rejuvenated. So, doing this offered the opportunity to keep communicating with people who only now discovered the show or are rediscovering it. So, it seemed like a great opportunity to help reenergize and rejuvenate people’s interest in Nine. Now that Star Trek Online has allowed, for a number of years and has been helpful and really served a great role in being, in a sense, involved in that. Odo as a character evolved so much over the course of Deep Space Nine, as we learned more about him and more about his people—and now it’s been even longer than that when we come to meet him in Star Trek Online. In what ways do you think Odo has grown and changed as a person by the time that we meet him in this new expansion? Auberjonois: Well, I think for the fans who have followed Deep Space Nine, it will be great. I’m sure they’ll notice a big difference in terms of the last time we saw Odo returning to the Great Link in order to begin the healing that was necessary. The person as we knew him joined— he was like, a Pinocchio character in the sense of the fact that he changes, and not knowing who he was. And then there was his love for Kira— and all of that developed, but he was a pretty unformed character when we last saw him. Now, in terms of the game, he has matured incredibly. Has taken a kind of leadership role that in the original series evolved to the point that it has in the online game. Odo and Kira had formed a close relationship by the end of Deep Space Nine’s run. So much of your performance as Odo was the voice, and your characterization you put into it and the make-up... but, there was a lot of physicality in your performance. How do you translate that sort of presence that Odo commanded physically when you’re performing the character just with your voice and a microphone? Auberjonois: Well, the nature of an online game is such that you’re delivering a lot of information that actually, for the players, that actually doesn’t require the same kind of emotional clarity that you’d need to achieve when you’re performing on camera. Many people were interested and impressed with the fact that even though Odo’s face was immobilized, basically, by this kind of mask that he wore, that he was still able to express emotions so clearly. That physicality that you mentioned—a tilt of the head. Or a glare in the eyes. It was also in the voice. And since those were all I could depend on—the physical and the vocal. Since the voice was a major part of it,I don’t think it was a problem. At least, it wasn’t for me as an actor. And it will work. You mentioned a few of your cast mates are returning along for the new expansion, so, how was it working in this universe with them again? Did you get a chance to record with them, or was your work mostly solo? Auberjonois: You know, unfortunately, I didn’t. This kind of work, you get used to working solo. I’ll say, as I said, just a couple weeks ago, I was in Germany with a lot of my colleagues who had already done their work on the game, and with great enthusiasm and excitement. Even though we weren’t all working together, I had a sense of the momentum. And I didn’t find it difficult. Nana Visitor, who played Kira, is also returning, and Odo had a very important relationship throughout the series. How do you think Odo feels about the potential of seeing Kira again, after all this time? Auberjonois: You know, I don’t want to give away any of the joys of discovering the game... it’s very complex. And to encounter Kira— both of them have gone through a lot of changes. Part of the game is seeing how they encounter each other... the way it’s been imagined, the complexity of how they encounter and how they work through them. So I don’t want to give anything away. As well as Victory coming out, 2018 is the anniversary of Deep Space Nine, and you still see the legacy of the show not just in Star Trek and things like Star Trek: Discovery, but in scifi in general. What is it do you think it is about Deep Space Nine that has made it such an enduring influence on science fiction all these years later? Auberjonois: Well, I think it’s because of two major factors. One, because Deep Space Nine dwelt on a darker plane than the previous, wonderful versions—the original and Next Generation, wonderful series without which we could have never existed. Deep Space Nine had a darker, more neurotic kind of outlook in the characters. The characters had darker sides to them. So that was part of it. But also the fact that it was really a forerunner—I won’t say it was the only one—but I think it was a major forerunner conceptually of a continuing story like this—being final and complete. There was a continuing arc to it, the seven years that I think has served it well. People can stream it and each episode after episode... that has influenced television in general, but primarily also in science fiction. Star Trek Online’s new expansion, Victory is Life, is available to PC players for free from today. Xbox One and Playstation 4 versions of the game will receive the expansion at a later date. Open Channel: What&apos;s Your Absolute Favorite Single Episode of a Scifi or Fantasy Series?